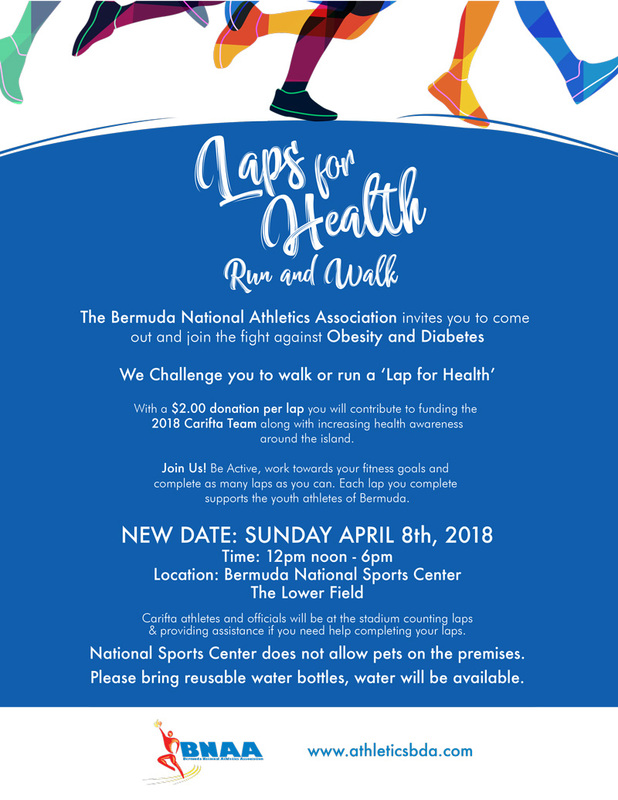 After its original date had to be canceled due to inclement weather, the Bermuda National Athletics Association [BNAA] is inviting the public to join the fight against obesity and diabetes with its ‘Lap for Health’ event on Sunday, April 8 from 12.00pm to 6.00pm at Bermuda National Sports Center’s Lower Field. “With a $2.00 donation per lap, you will contribute to funding the 2018 Carifta team, along with increasing health awareness around the island. “Join us, be active, work toward your fitness goals, and complete as many laps as you can. Each lap you complete supports the youth athletes of Bermuda. “Carifta athletes and officials will be at the stadium counting laps and providing assistance if you need help completing your laps. National Sports Center does not allow pets on the premises. Please bring reusable water bottles, water will be available.